PCIDU | Comics I Don't Understand - This site is now being updated daily at http://www.comicsidontunderstand.com. Please change your bookmark if necessary, and notify any web site with a link to the old address. Well, Homer is often depicted watching fox-news-esque TV broadcasts (all the funnier given that The Simspons is a Fox show) and then promptly railing in anger at whatever ‘liberal outrage’ the news has just discussed. Yet he’s also well liked by the American public. Fred Thompson = Homer Simpson? Well, it looks like Homer more or less represents W, as a likable (in the beginning, to some) doofus who’ll probably doom us all; I suppose they’re saying the Republicans want another easily controllable stooge like him to be president in ’08. Cheney is obviously channeling the evil Mr. Burns (or vice versa), and Homer’s beloved pig (who doomed Springfield in the movie) is Bush’s beloved advisor Karl Rove (who doomed the US in real life). Lisa is the state department, ever vigilant, while Bart wields the slingshot of “Justice.” And to top it all off, despite the show’s arguable liberal bent, it made the Fox News Network possible, and the movie’s huge grosses no doubt helped Rupert Murdoch buy the Wall Street Journal. So, yeah, keep it up, Simpsons fans! You’re the Republicans’ greatest hope! Or maybe the pig with Karl written on it is a Turdblossom joke? The left is fueled by hate. I think it’s just that the Simpsons are a Fox product. 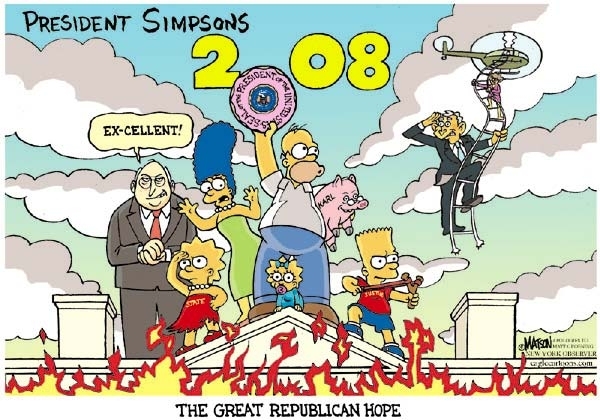 I read it as saying that the Republicans’ only hope in 2008 is to have the Simpsons elected president (collectively, apparently). The White House is burning (in scandal, no doubt), thus explaining W and Condi’s rooftop escape by helicopter. Presumably, Lisa as Secretary of State and Bart as Secretary of Justice, along with the others serving who-knows-what roles, would be expected to put out the fire and keep the White House in Republican hands. To Powers: good eyes! I didn’t even SEE Condi on the ladder with George! I can’t believe he let her go first! Well, to be honest, that might be Laura. Lisa is a liberal do-gooder, so portraying her as Secretary of State in a Republican administration makes no sense. Humor is based in truth. Since liberalism has no grounding in truth, liberal cartoons are rarely funny. I have the opposite view as Bill Rigdon. As a liberal, I very rarely find conservative cartoons funny. Every time I read Mallard Fillmore I find myself scratching my head and saying “Even if I agreed with this duck, would I actually find him humorous?” Does anyone out there manage to find political cartoons of the opposite ideology funny? For that matter, I’ve always wondered about the broad popularity of the Simpsons. The show definitely has a liberal bias. Maybe it just means the American public is too caught up in pop culture nonsense like the Simpsons Movie to notice or care about what’s going on in its government, allowing the Bush administration to get away with murder, and their hope is that people will be similarly distracted in 2008? I think the entire strip is a comment on how we’re turning politicians into celebrities, and celebrities are now becoming politicians; (now? Where was this strip when Ronald Reagan was elected?!) and the perception that a celebrity is dumber than, say, Homer. But I could be reading too deep in this. I have a request — there are plenty of places on the internet that conservatives can bash liberals and liberals can bash conservatives, lets not turn this forum into one of them. I have to second Nicole here. One of the good things about this blog is that it usually provides a haven from the shrill partisan rhetoric which has replaced thoughtful political discourse in 2007 America. That said, I think Powers’ interpretation of the cartoon was correct, i.e. nominating popular dimwit Homer Simpson is the only hope for the currently ailing GOP. It’s a clumsy and hackneyed joke (though nicely rendered visually). Sorry Nicole, Joe. I’ll restrict my political comments to the crimeweek comments (as those are often explicitly political). In my defense, I didn’t think I was bashing conservatives so much as making a general statement about the difficulty of finding humor of the opposite ideology funny—that is, I wasn’t attacking Bill Rigdon, but saying that I had the same reactions to political humor, with the liberal/conservative labels reversed. Perhaps it is OK to say that I had the same first reaction as Bill Rigdon, that Lisa did not belong in this administration? Thanks Autumn Harvest. I am certainly not one you have to ask for approval to post anything — it is after all Bill’s list. But I will clarify what I am talking about. This is clearly a political cartoon — one that we have differing opinions on and I want to read all the opinions about the cartoon, however if someone makes a statement that starts with ‘conservatives are…’ or “liberals are…” then it is more likely you are expressing a general political opinion than one about the cartoon. Don’t they know that including Homer Simpson in your plans is a sure path to disaster? Anything involving him is destined to backfire spectacularly. Nicole, yes, I understood it to be a request, not an order, and a pretty reasonable one. The Crimeweek columns are a little different, since they are opinionated and semi-political, but there’s no reason that the comics can’t be fight-free. As for the cartoon itself, I suspect that Powers is only half-right. The Simpsons are the only chance the Republicans have to keep the White House, but I think (from the cartoonist’s point of view), not there to put the fire out so much as to keep it going—as in “only Homer Simpson would be dumb enough to keep our current disasterous course unaltered.” I’m not endorsing this view, just saying that this is probably part of the message of the cartoon.